Auckland based couple Paul Culpan and Sasha Brownlie (Te Atatu) claimed the premier Men’s and Women’s Longboard Divisions at the Ray White Duke Festival of Surfing completed at New Brighton Beach, Christchurch today and together surged to the top of the national rankings. The surf remained around the 0.5m for the final day of the event with light winds doing their best to keep conditions contestable under grey skies. 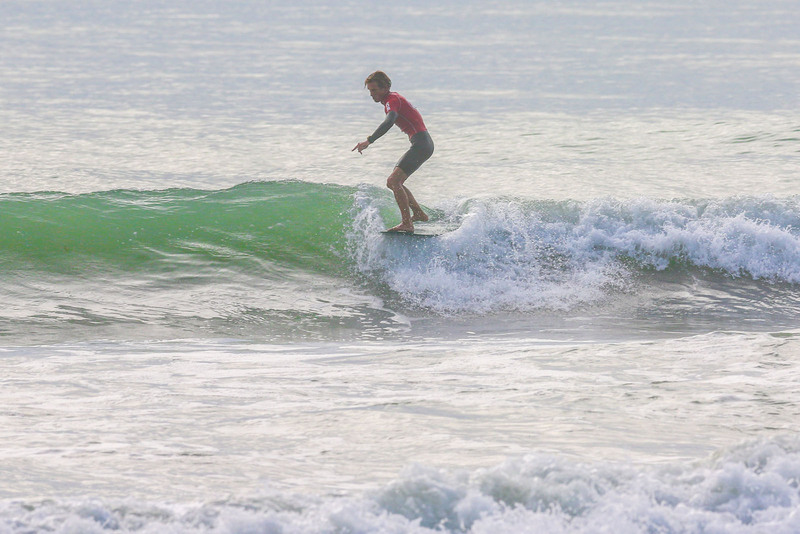 Twenty finals were contested throughout the day across longboard, stand up paddleboard and junior divisions. Culpan contested his third straight final this year having placed fourth at the National Titles in January and third at the Barrett Homes Surf Open in February. Today he posted a 14.2 point heat total for a comfortable victory. The small surf suited the light-weight Culpan as he glided across the small waves and effortlessly tiptoed up and down his board wringing out every point he could from the waves. Culpan pipped defending champion Luke O’Neill (Chch) and Hugh Ritchie (Chch) who finished on 10.6 points each, O’Neill getting the runner up finish on a countback. Taranaki’s Michael Grendon finished fourth in the final and now sits alongside Culpan in equal first on the rankings. Sasha Brownlie also jumped to the top of the national rankings after finishing with an 8.87 point heat total to take out her final. In the same manner, as her partner, Brownlie had surfed to a third and a fourth in her previous two finals this year. Brownlie was pushed for the title by Estella Hungerford (Chch) in the final, Hungerford finishing runner up on 8.10 points. Donna Henderson (Chch) and Jo Moore (Tara) finished in third and fourth respectively. In the junior divisions, it was local surfer Myka Black making a return to the competitive arena in menacing fashion, walking home with three titles spread across the Under 20, 18 and 16 Boys Divisions. Black was the form surfer throughout the weekend as he picked off all the best waves and capitalised on every small section that presented itself. The titles in the girls divisions also went to the one surfer in local Ava Henderson after she took out the Under 20, 18 and 16s in the same fashion as Black. 13-year-old Henderson was also surfing up a division from her Under 14 Girls Division. Mount Maunganui surfer Tao Mouldey surfed to wins in the Under 14 and Under 12 Divisions. The young goofy footer produced two dominating finals performances posting scores in excess of 13 points. Another Mount Maunganui surfer, Anna Brock was successful in the Under 14 Girls Division claiming the title over Misha Peyroux (Dun), Chloe Groube (Pau) and Eden Hungerford (Chch) who finished second through fourth. Groube went two places better in the Under 12 Girls Division taking out the win over double finalist Eden Hungerford. Kaikoura surfer Alan Te Moananui claimed his first national victory in the Stand Up Paddleboard Division. Te Moananui secured the win in the late stages of the final after pipping Shayne Baxter (Chch) 11.5 to 10.90 points. Thirteen-year-old Amelie Wink (Chch) won the Women’s Stand Up Paddleboard Division defeating New Zealand representative Lucy Te Moananui in the process, Te Moananui placing second. In the senior longboard divisions it was Michael Grendon that made up for his fourth in the Open with a win sitting alongside 1992 Olympic silver medalist Annelise Coberger who won the Over 40 Women’s Division. Coberger, surfing in her first ever surfing event, also claimed the Women’s Logger Division over Sasha Brownlie while Luke O’Neill (Chch) made up for his runner up finish in the Open Men’s with a win in the Men’s Logger. Australian based Mike Pimm was too good for his opponents across both the Over 50’s and 60s divisions walking away with all the accolades. Please see below for final results from the Ray White Duke Festival of Surfing completed at New Brighton Beach, Christchurch today (Sunday 17 March). The three day event celebrates the sport of surfing under the name of legendary Hawaiian waterman and Olympic swimmer Duke Kahanamoku with surfers from the length of the country heading to New Brighton to take part. While many enter the event for the festivities and the great cause behind the festival which brings to life New Brighton, there will be some fierce rivalries for positions within the New Zealand Team. The Ray White Duke Festival of Surfing features over $15,000 in prizes making it one of the richest events on the New Zealand and South Island Surfing Circuits in 2019. In 2015 Ross Tyson made the amazing replica of the Duke’s surfboard as part of the centenary celebrations of Duke Kahanamoku’s surfing and swimming displays in the area. Ross designed the support framework; the pattern for the board was kindly drawn out in full size by Mark Calcutt; Dave Poyner finished the board surface with a beautiful high spec coating. These celebrations spurned the inaugural “Duke Festival” the following year and the festival is now one of New Zealand’s largest surfing events. The Duke Festival is about more than just the sport of surfing; it’s about the culture of the beach and those who love the sand between their toes and salt in their hair. The Duke Festival uses the sport and culture of surfing to raise pride in, and the perception of, the wider New Brighton area. For more information on the Ray White Duke Festival of Surfing please contact Warren Hawke on 021 293 5735 or wajhawke@yahoo.com or Ben Kennings on 021 2278732 or email benkennings@surfingnz.co.nz. Keep in touch with all the surfing info from around the country by following @surfingnz on Facebook, Instagram, Twitter and Snapchat. Follow the Ray White Duke Festival of Surfing on Instagram – @dukefestivalofsurfing, Facebook – @Dukesfestival and @dukefestivalof2 on Twitter.